This is a great general irrigation use type of sprinkler for outdoor use with cold water only. They put out a great amount of water coverage with adjustable stops for full or part circle operation. Every impact sprinkler head comes with a set of nozzles allowing you to match your sprinkler to your available flow and pressure. 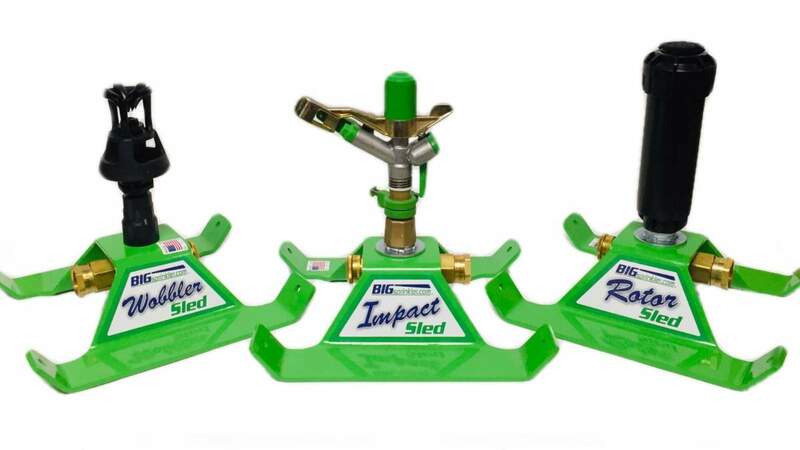 These sprinkler heads have no "impact vibration." This means you'll have a smoother gentler performance over impact sprinklers. The gear drive system rotates the sprinkler head at a uniform speed. This provides a more even water distribution over an irrigated area. Every gear drive sprinkler head comes with a set of nozzles allowing you to match your sprinkler to your available flow and pressure. Our Xcel Wobbler distributes rain-like droplets that resist wind drift and evaporation. This sprinkler head gives instantaneous uniform coverage over a large area — with low water pressure. It has a minimal impact on soil structure, so it’s great for germinating. The Xcel Wobbler is built for strength and durability. It's made with no metal parts, but high-impact engineering grade thermoplastics instead. We carry a variety of spare nozzles for our different sprinkler heads and carts. Each nozzle types comes in a range of sizes to match your given flow rate and pressure. You're sure to find the one you need here.